Chris Baty, founder of the wildly successful literary marathon known as National Novel Writing Month, has completely revised and expanded his definitive handbook for extreme noveling. Chris pulls from over 15 years of results-oriented writing experience to pack this compendium with new tips and tricks, ranging from week-by-week quick reference guides to encouraging advice from authors, and much more. His motivating mix of fearless optimism and practical solutions to common excuses gives both first-time novelists and results-oriented writers the kick-start they need to embark on an exhilarating creative adventure. Chris Baty founded National Novel Writing Month in 1999. His work has appeared in such publications as the Washington Post, The Believer, and AFAR. He lives in Berkeley, California, where he works as a teacher, speaker, and writer. 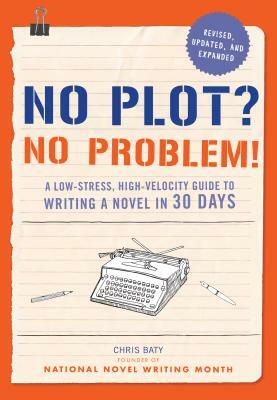 "No Plot? No Problem! offers suggestions on how to participate in something as crazy as writing a short novel in a single month, as well as why you'd want to do so. Baty gives practical tips peppered with humor, recognizing that this endeavor is both enormous and somewhat ridiculous, but still worth doing. Baty walks you through things like how to find time to write, what tools and foods you should keep handy, and the benefits of planning (or not planning) your novel ahead of time. The second half of the book is a week-by-week guide, intended to walk you through the first week exuberance, second week slump, and so on. Baty's been at this for 15 years already, so he knows what he's talking about-plus he has quotes and advice from many other NaNoWriMo winners as well."